This week, nearly 3,000 attendees, exhibitors, and speakers convened in Baltimore for the 111th AALL Annual Meeting & Conference. Whether you joined us there or were following the action from home, the conference featured programs galore, a dynamic exhibit hall, and countless networking opportunities. Another new CONELL class was established, and keynote speaker John Waters delivered a raucous kick-off to the conference, setting a lively tone for the busy days that followed. In a few weeks, you’ll be able to access the audio recordings of most conference programs. 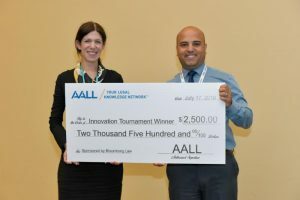 Judges’ Choice Winner: Ayyoub Ajmi from the University of Missouri-Kansas City (Using CiviCRM as a Comprehensive Case Management Tool) Even though the dust has barely settled in the wake of this year’s conference, we’re already looking ahead to AALL 2019 in Washington, DC. You can book your accommodations now and rest easy knowing that you can make adjustments to your reservation later, penalty-free. It’s not too soon to start thinking about the programs you’d like to see next year either. Check out the “must-have” program topic suggestions already percolating, and add your own as well. Stay tuned for the Call for Proposals at the end of the summer, and mark your calendars to join us next July 13-16. 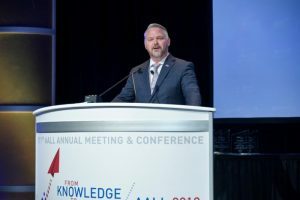 Online voting for the next AALL vice president/president-elect, treasurer, and Executive Board members opens October 1 and runs through October 31. AALL-elected members of the board represent you and your interests as law librarians. It’s important to make an educated decision, and we encourage members to learn more about the candidates before voting opens by visiting the biographies and statements page on AALLNET. DID YOU RENEW YOUR AALL MEMBERSHIP? Don’t lose access to all that AALL offers—renew your AALL membership by August 1. AALL is the only national association exclusively dedicated to law librarians and other legal information professionals, and we are stronger and more successful together. Our members are problem solvers of the highest order and enable AALL to offer the knowledge, community, leadership, and resources you need to stay ahead of the curve. Are you a champion for our profession and our members? Consider adding the Championship Upgrade to your renewal. Committed ambassadors to the profession and the Association can add the $75 championship upgrade through the membership application when renewing. As a retired member you have a new option to renew your membership with AALL. The Sustaining Membership allows you to enjoy the benefits of AALL without having to renew each year. Sustaining Members pay a onetime renewal rate of $425. (Note: Sustaining Memberships are purchased in the AALL Store.) It also makes a nice gift! To enhance our sustainability efforts, membership renewals are now digital. Paper invoices will no longer be sent; however, members may print invoices from their account if desired. If you have any questions about your membership renewal, contact AALL Headquarters at membership@aall.org or 312.205.8022. In Patent Trial and Appeal Board (PTAB) proceedings and in patent litigation, lawyers need to prove that prior art was available to the public before the application date of the patent in question. Legal information professionals supporting work in this area need to provide the proof. If you’ve ever been asked to get a date-stamped copy of an article or book or a declaration about the date on which an item was made available to the public, this session is for you. Learn why declarations are important and how lawyers use them. Explore why library date stamps are no longer sufficient on their own, as well as how to get a declaration and who can provide them. The discussion will also include how to overcome some of the barriers to proving the date of availability. Managers today need skills that will help them manage effectively and produce results. From transforming libraries and nurturing staff for new roles and responsibilities to developing a strategic plan for the library, law library managers have a lot on their plates. 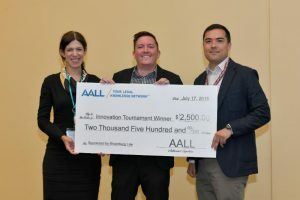 The 2019 AALL Management Institute provides participants with the opportunity to build management skills, collaborate with colleagues from different library types, learn in small group settings, and develop techniques to manage with confidence. Additional information will be forthcoming. This 2017 AALL Annual Meeting program addresses the different ways in which our libraries are laboratories of technology that empower students, law clerks, and associates to learn tech that will make them successful lawyers and advocates. This program explores the types of technologies that should be available in these labs, the space requirements, and how to find funding to support these innovative learning and software practice tools, apps, and more. “Flow,” a term coined by Mihaly Csikszentmihályi, is the state of deep immersion in an activity that is inherently gratifying. Csikszentmihályi became interested in the concept after noticing how some artists become totally engrossed in their work—so much so, that they seemed to lose perception of time. Flow is a satisfying state often resulting in innovative and outstanding work. As librarians, we’ve all experienced the joy of flow at various times when working on particularly rewarding projects. As leaders, we can use the concept of flow to enhance our organization’s outcomes and make our colleagues’ jobs more rewarding. Kenton Brice, Femi Cadmus, Patrick DiDomenico, Kate Hagan, Brian Kuhn, Saskia Mehlhorn,and Jeff Ward were recognized as the 2018 Fastcase 50, which honors a diverse group of lawyers, legal technologists, policymakers, judges, law librarians, bar association executives, and people from all walks of life. Kathryn Fitzhugh was among a few black female legal professionals recognized by the W. Harold Flowers Law Society Inc. as a “legal pioneer and living legend” during the society’s annual banquet. Mary Jenkins was recently named Manager, Research Solutions at AccuFile, Inc. She now leads AccuFile’s virtual research service, AccuDesk. Stephanie Wilson has been appointed Interim Director of the Supreme Court Law Library at the New Mexico Supreme Court in Santa Fe. Wilson currently serves as Law Librarian Senior at the Supreme Court Law Library. George S. Grossman began his legal career with the American Bar Foundation, even before he graduated from law school in 1966. 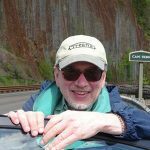 In addition, his work in law libraries began before completing his Master of Library Science in 1971. Throughout his career, he has held many positions, including law librarian, library director, and professor of law in Utah, Minnesota, Illinois, and California. He influenced law students and lawyers throughout the country as editor of the “Library Highlights” column of the American Bar Association (ABA) Section of Legal Education and Admission to the Bar. He retired in 2006 as professor of law emeritus from the University of California, Davis School of Law. Coming from the technical side of libraries, Grossman’s interests were always forward-thinking, and his works highlight his ability to peer into the future of law librarianship. He was also deeply concerned about social justice issues. He was a founder of the Contemporary Social Problems Special Interest Section and had a special interest in the rights of Native Americans, publishing extensively on this topic. His AALL participation included membership in committees dealing with the preservation and indexing of periodical literature, ethics, and employment practices. For the ABA, he served on the Committee on Law School Facilities and on the Committee on Libraries. Grossman was honored during the Association Luncheon at the 2018 AALL Annual Meeting with induction into the AALL Hall of Fame. He passed away on July 11, 2018. 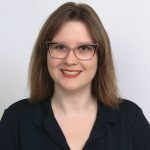 In this month’s member profile, Christine Bowersox, training and research librarian at Milbank, Tweed, Hadley & McCloy LLP in New York talks community and the value of AALL membership.